Dozens of infamous criminals like Doc Barker and Bernard Coy attempted to escape from Alcatraz Island. 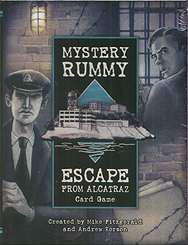 In this exciting Mystery Rummy card game, you are in charge of uncovering prisoners' devious escape plans. On each turn, gather information by melding matching Plan Cards or playing off an existing Plan. When players collect 8 matching Plan Cards and identify the Plan's mastermind, you can foil the Escape Plan, capture the culprit and score points. First player to earn 100 points is the winner. Let no prisoner escape from the "Rock!"